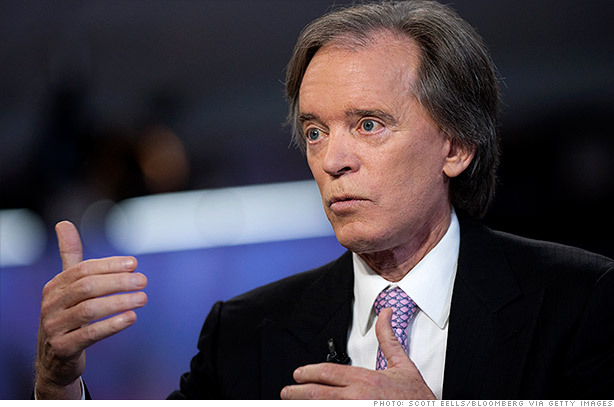 Bond guru and Pimco (PTTRX) managing director Bill Gross isn't buying into the bull market. In fact, he's warning investors to be afraid, be very afraid, of how inflation and the flood of cheap money will affect all investments. Investors should be prepared to accept "lower returns on bonds, stocks, real estate and derivative strategies," Gross wrote in his monthly letter entitled "Credit Supernova!" Championing something of a bunker mentality, Gross told investors to buy Treasuries with shorter durations and buy gold or other investments that "you can sink your teeth into." Go outside of the U.S., he says. Buy currencies from countries "with less hyberbolic credit systems" including Australia, Brazil, Mexico or Canada. The U.S. won't fit that bill. He doesn't suggest totally eschewing stocks, but says investors should look to global stocks with stable cash flows. Gross has been warning investors about the potential downsides of the Federal Reserve's bond buying strategy for months, but the tone of this month's letter was decidedly more fearful. While the letter's title obliquely references the band Oasis, Gross opted to lead his monthly missive with an ominous T.S. Eliot quote rather than his usual song lyric: "This is the way the world ends... Not with a bang but a whimper." The world Gross refers to is the monetary system. "Today's near zero bound interest rates cripple savers and business models previously constructed on the basis of positive real yields," Gross writes. Gross admits that "the end of the global monetary system is not nigh," but says we're approaching a time where "investable assets pose too much risk for too little return." What else should an investor do to prepare for what Gross sees as something of a financial Armageddon? He says one of his investment committee members wants to buy land in New Zealand and set sail. Land has an inherent value, suggests Gross, unlike other so-called investable assets.